The Association works tirelessly to uphold and advance the rights, standards, and working conditions of its members. Also, it is the only statewide voice that initiates legislation to promote laws in the best interest of its members. The policy provides a benefit of $12,000 while under the age of 70. Over 70 years benefits are $5,000. 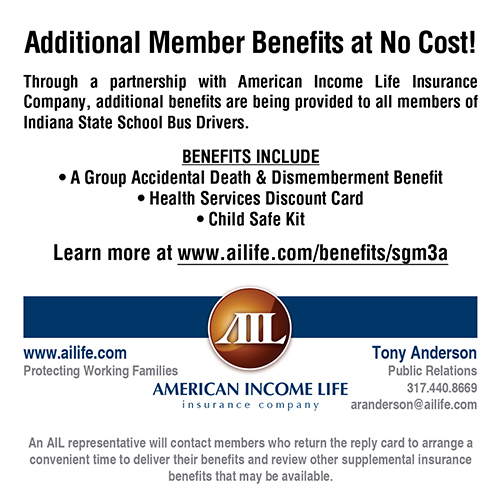 This insurance is included in your $30 membership dues to the Indiana State School Bus Drivers Association. This is only for accidental death. Published twice yearly to keep members well informed. The Association will pay one-half of these fees, up to $500 (1/2=$250) to an attorney of the member's choice for any problem involving the member while fulfilling the duties of your school bus related occupation. Please notify a Board Member if you seek advise of an attorney within 90 days of the school bus related occurrence. Remember, your association is a nonprofit organization. WE HELP ONE ANOTHER. Tell other drivers about your association. We help several drivers each year. The president of your Association is a member of this important committee, which draws up the specifications for school buses, and other items concerning school buses. Mail your $30 dues to Ron Chew, 7061 E. County Rd. 600S, Straughn, IN. 47387. Please print this page and mail the below form with your dues. Make check or money orders to: Indiana State School Bus Drivers Association.